NEW YORK—Members of the Chinese Communist Party are leaving the party by the tens of thousands, like the grains of sand slipping through the CCP’s hourglass. An event to support the 138 million Chinese who have quit the Chinese Communist Party (CCP) and its affiliated organizations was held in front of the United Nations building in New York City on May 17. Hundreds of people, most of them Chinese, filled Dag Hammarskjold Plaza quietly holding banners, while speakers took turns at the podium, engaging the audience on what the Quitting the CCP movement really means for China today. The “Tui Dang,” or “Quit the Party” movement is an embodiment of nonviolence and an awakening of conscience that is changing China. Introduced in November 2004 after an editorial series published by the Chinese edition of The Epoch Times revealed an uncensored history of the CCP, people began quitting by the tens of thousands, recording their decisions on a website maintained by supporters of the movement. “In this way, the communist organization is quietly collapsing,” said Yi Rong, chair of the Global Service Center for Quitting the CCP. Speakers ranged from the heads of several human rights organizations to people who have first-hand experience with the CCP’s system of forced labor camps and prisons, where Falun Gong practitioners are frequently tortured. Many attendees were practitioners of the Chinese self-cultivation practice Falun Dafa (also known as Falun Gong), which has been brutally persecuted by the CCP since 1999, according to the Falun Dafa Information Center, the official press office for Falun Gong. The CCP’s crimes—including over a 100 forms of torture—against the group were talked about by the speakers. Congressman Chris Smith, co-chair of the Congressional-Executive Commission on China, sent a letter to support the event. 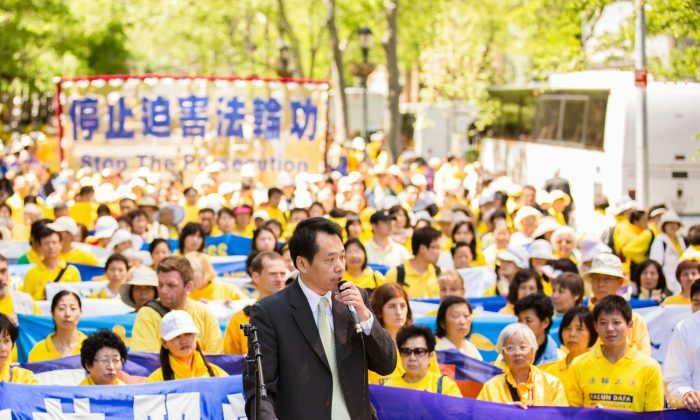 He said he supports the 8,000 Falun Dafa practitioners arriving in New York City for weekend activities, and called for an end to the persecution against Falun Dafa in China. The movement to quit the CCP is seen by many as the only peaceful road towards the regime’s inevitable collapse. Baiqiao Tang, chairman of China Peace, and a leading Chinese dissident, was among the speakers at the rally. He co-authored “Anthems of Defeat: Crackdown in Hunan Province 1989–1992,” published by Human Rights Watch. Speaking through a Chinese interpreter, Tang said that in 2010 there were an estimated 150,000 large scale public demonstrations throughout China, and after that year, the CCP stopped publishing the statistics. While the CCP’s military budget is one of the highest in the world, it spends even more on monitoring and persecuting its own people, according to Tang. He said the riots erupting across China are the reason the CCP spends money on surveillance, Internet censorship, and paramilitary personnel on the streets. Falun Dafa meditators from all over the world gathered at Dag Hammarskjold Plaza Friday, near the United Nations in New York, to kick off a three-day conference. An Indian political party in the state of Jammu and Kashmir protested against the arrival of the People’s Republic of China Prime Minister in India.